Salomon has set their sights on the ever-growing backcountry skiing crowd and the Salomon Guardian is their entry into the alpine touring binding market. This is the exact same binding that Atomic released; only with a different name and different cosmetics. This is possible as both Salomon and Atomic are owned by parent company Amer Sports. 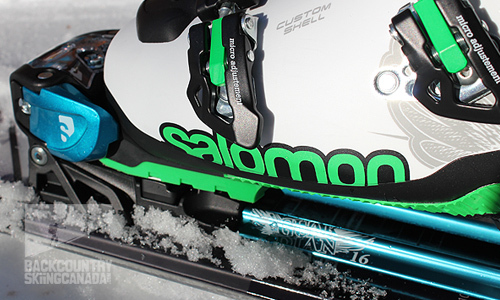 We first skied the Salomon Guardian 16 AT bindings at the Red Resort Gathering event held back in February 2012. 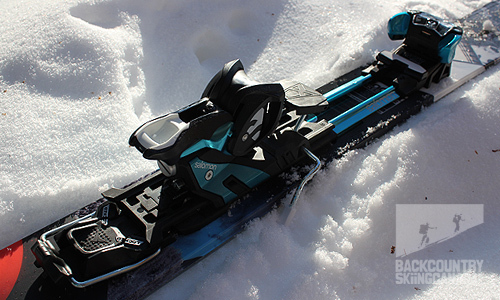 The few hours that I had to play on the Guardians, which were mounted on the Salomon Rocker 2 115 skis, was a good initial, albeit short, test. Right off the bat, I quickly realized that the Guardian binding does not accept traditional Alpine Touring boots with a rockered toe. This is a limiting factor, but luckily the Salomon Quest 120 Max boots utilize ISO 5355 standard soles, so they are compatible with the Guardian bindings. This was not the case for my Dalbello Virus ID AT boots. Salomon on Salomon, a great secure fit. Alpine touring specific boots are not compatible. 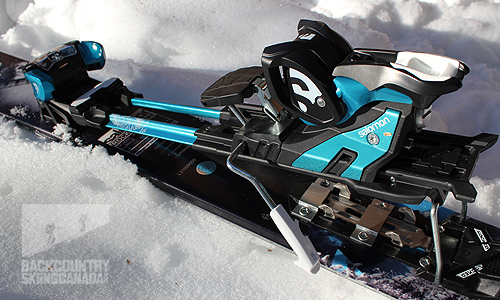 The Salomon Guardian 16 AT bindings are a departure from traditionally lighter alpine touring bindings like the popular frame-style Fritschi Freeride or Scout bindings or the tech styles from Dynafit and Plum. 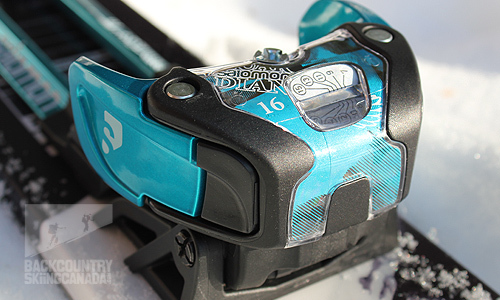 The Salomon Guardian 16 AT bindings are more in line with the Marker line-up of the Duke and the Baron. 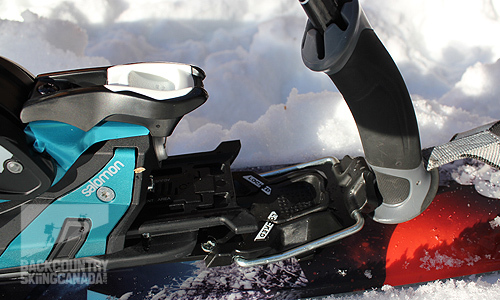 At 2960g per pair the Salomon Guardian 16 AT bindings are undeniably heavy, but with this weight comes some benefits as well. Salomon has branded the Guardian 16s with the tagline "Lower, Wider, Easier" and I would have to agree with each of these. Although each is a relatively minor point on its own once they are all combined they do create an improved skier experience. First, “lower.”At just 26mm, the stack height (the distance from the ski to your boot sole) is quite low compared to the competition, almost a full centimetre lower. 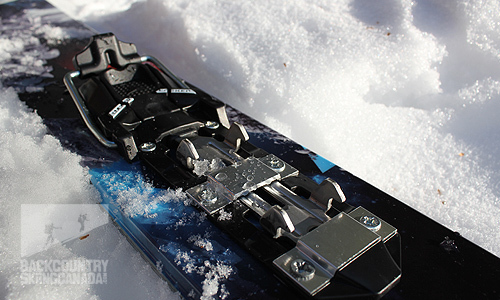 This low height gives you improved stability and allows you to feel the snow under your skis. The other big number on these bindings (besides the weight) is the width. At 80mm across the toe pivot point you have a big chassis which can drive fatter skis making it more fun to ski in the deep stuff. Wider also means more leverage to get the ski up on edge when we need it to turn and carve. Finally "Easier", refers to the 'hike and ride switch" as Salomon calls it. I prefer to say walk and ski modes personally but I won't argue with marketing semantics. The switch mechanism is located behind the binding's heal piece, which is similar to the Fritschi design and differs from the Marker under the foot design. This makes logical sense because now you can remove your skins (if you've got the moves) and switch over to ski mode without having to take off the binding. This saves time and energy. "Easier" as well because you can perform the switch with your pole by pushing backwards. Similarly you can engage the risers with your pole handle if it has a slight hook similar to that found on the Black Diamond Pure Carbon Poles. So the "Lower, Wider, Easier" mantra holds true but I would add in one more, "Heavier". Before you launch off on why would anyone want a heavier binding, read on because low, wide and heavy provides great confidence for skiing. 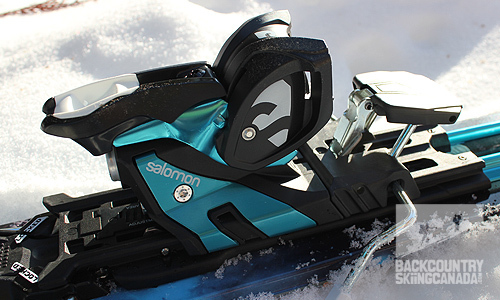 Salomon has a long history of manufacturing high-performance big mountain bindings and the Salomon Guardian 16 AT bindings are no different, other than the letters AT in the name. These obviously mean alpine touring and hence the ability to walk and ski in them. 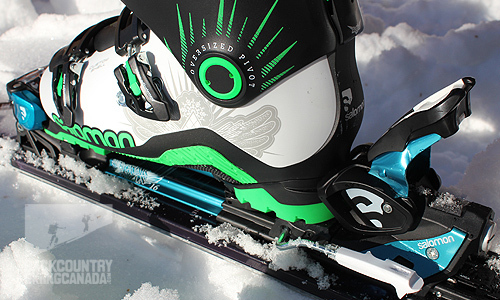 Other than this feature you would swear you had a pair of alpine bindings securing your boots. The Salomon Guardian 16 AT binding instils confidence the moment you click in and this flows over and inspires confidence while skiing. You feel secure and stable with plenty of weight underfoot. The plastic bits are kept to a minimum and there is a whole-lotta metal underfoot which allows you to let them run fast knowing they will not spontaneously switch to tour mode mid huck. - Aluminum bars for torsional rigidity and control. - Metal on metal pivoting prevents wear and play with prolonged use. 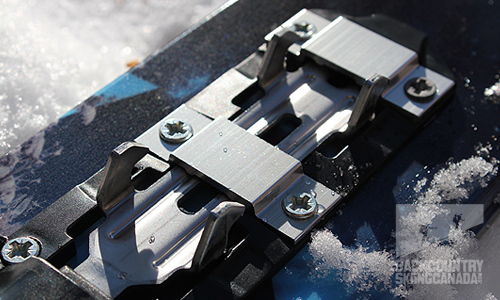 - Adjustable toe height (bindings are designed for use with alpine ski boots that have Solomon certified WTR (Walk to Ride) or ISO 5355 standard soles). - Boot sole length adjustment of 55mm. (Small fits soles of 265—320mm. Large fits 305—360mm). - Toe pieces are 80mm wide with flat noses, allowing a 90-degree pivot when climbing. - Includes removable 115mm brakes (optional 100 and 130mm available). - Strengthened rigidity—to improve edge-to-edge power transmission. 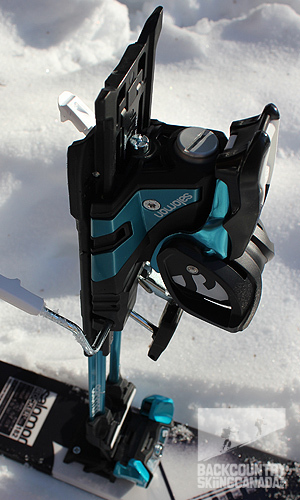 - Din 7-16 accommodates most skiers’ levels and weight. The Guardian 16s Hike and Ride Switch enables you to quickly change from hike to ride mode without having to take your skis off, a great feature if you are a one-legged skin peeler (which I am). 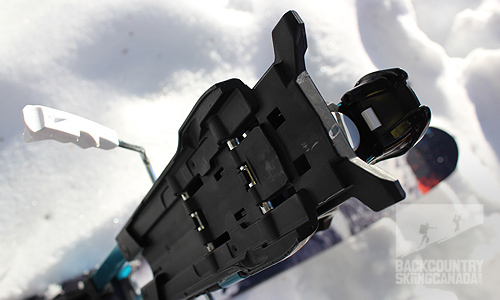 The switch mechanism is located behind the heal rather than under the boot and is fairly easy to engage with a ski pole. This all translates into a faster transition time from hike to ride. 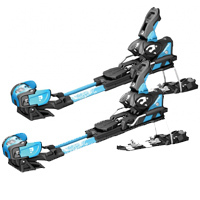 The riser has two positions (up and down) and is relatively easy to engage; however, you do have to get used to the fact that it needs to be in the forward and down position so you do not inadvertently switch back to ski mode. It's easy to do and it caught me three times on the first day out. 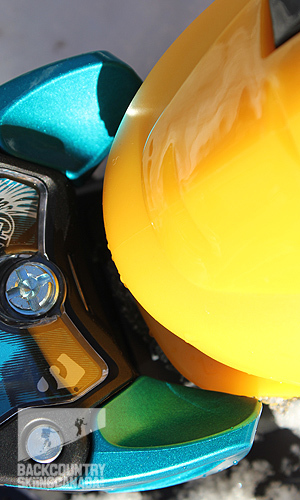 With the switch mechanism behind the foot, it is a much easier transition than the Marker design which has it located in the middle and below the boot. 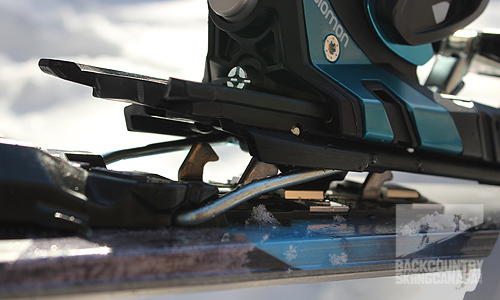 Not only do you have to take off your skis to switch over with the Marker F12 AT binding but it can also be finicky when there is snow and ice build up around the binding. Push back with the pole to release your heel. Lift up with the other end of your pole to engage the riser. The low setting, you can see the riser is needed so that you do not re-engage into ski mode. High setting for hiking up steeper lines. Lots of metal in the Guardian ensure that returning to ski mode is as easy as stomping your boot down. No snow and ice build up with these metal jaws. The Guardian 16's Low Profile Chassis has a lower overall stand height (26mm) for greater stability and enhanced terrain feedback. 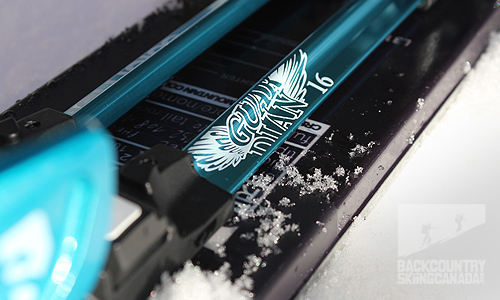 At 80mm the Guardian 16's Oversized Platform provides more power transmission and responsiveness so you can get the ski from edge to edge quickly. Being most of the way to the top of the hill but not quite over it yet (we're talking age here) I tend to prefer lighter backcountry gear. After all, the less weight the more my knees and back like me at the end of the day. So with this in mind, I was less than excited to haul the additional 2.2 kilograms of binding weight up the hill with me. To be fair, however, they are 2.2kg heavier than my dedicated ski touring tech bindings. As a more relevant comparison (apples to apples as they say) the Guardians are 930 grams heavier than my slackcountry set up. This is still a big number to ponder with every slow methodical step up the skin track. Having said that, however, the Guardians are intended more as a slack country binding and are mostly designed to be used for lines closer to the resort or trailhead. With this in mind, I trudged up the skin track surprised to find that I was not any more tired or worse for wear given the extra hold gravity apparently had on my feet. 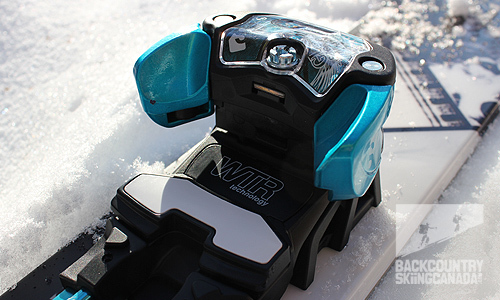 Given that the Salomon Guardian 16 AT bindings are heavier, what are the benefits to offset this? Simple, a heavy binding simply instils confidence that you can feel with every step and this translates into a more aggressive ski style on the way down. It also provides a smooth and efficient stride on the way up with a relatively quiet heel strike thanks to a softer plastic cover that dampens the usual clack, clack, clack on the up track. The transition from walk to ski mode is an easy pole poke behind you. The riser is quick to engage but it would be nice to have another position other than low and high for those middle of the road climbs. It also took some time to re-train my brain that the riser goes forward and not back to switch to walk mode. 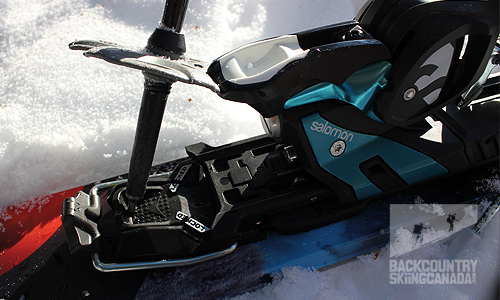 Getting back into ski mode is just a solid kick down on the heel and whammy the steel jaws lock you down and you are ready to take on any terrain. One design issue that is not of much short-term concern but one that we have on long-term watch is the fact that the heel piece does have a small lateral jiggle when it’s in lockdown mode. It seems to be a combination of the heel lock down plate and the toe pivot point each having minute tolerances that add up to allow for a minor jiggle. It's not noticeable when walking or skiing but something I will keep my eye on this as the binding wears and tolerances possibly become larger. Final words … the Salomon Guardian 16 AT bindings ski like a downhill binder but climb like beefy alpine tourer and it will let you scream down anything with confidence. "Lower, Wider, Easier, Heavier" is a mantra that does work for some, this reviewer included (in the right circumstances, such as slackcountry days). If you are looking for more information on Salomon's new Guardian WTR 13 AT Binding then give a click over here and read on. A full 90-degree pivot point. The underside of the base plate has metal connectors so it is metal on metal.